When you’re experiencing issues with your air conditioning unit or heater, it’s important to call a professional HVAC contractor. There are plenty of competitors on the market for your heating and cooling work, but not all companies are created equal. Honest and knowledgeable service is worth putting in some extra research to find. An HVAC contractor impacts not only your wallet, but your comfort and safety as well, so make sure to choose the right one by taking advantage of these helpful tips. Do they survey your home BEFORE estimating costs? Do they recommend higher efficiency equipment? Can they tell you your annual heating and cooling costs? Are their prices fair (not outrageous, but also not lowest)? Do they belong to a professional association? Do they understand the importance of equipment sizing? Are the products they sell high quality? Are they based out of a local location? 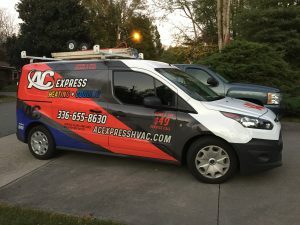 You can trust the team at AC Express Heating & Cooling LLC with all your heating repair and air conditioning repair needs. We proudly serve Winston-Salem and Clemmons, NC.